Call or Text us: 507-304-2579 - OR - Email: Sales@FragtasticReef.com - Customer Service 7 Days a Week! Why Fragtastic is the Best! Fragtastic Reef is a REAL store with REAL Customer Service. Shopping online can be frustrating not knowing who is selling out of their basement or garage. Fragtastic Reef is one of the very few REAL fish stores that also sells online, and has a FULL Brick and Motar Retail Store! We not only have a full retail location but also a warehouse with massive selection of inventory in stock, and you can even pickup at our retail location. Most products on our website are in stock and shipped by us from our retail location. Be sure to also go to Our Facebook Page and Like Us. We have giveaways, discounts, and specials on there all the time. There is no purchase necessary on our giveaways and prizes. Make sure also to sign up for our Email updates, to keep in the loop with new products and specials we are doing. You can finally stop waiting on hold with those other online vendors. 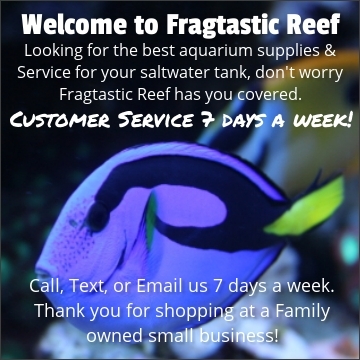 Fragtastic Reef is open 7 DAYS A WEEK - Because we care about your success and your tank! IN STOCK - SAME DAY SHIPPING! Hanna HIREEF master test kit includes everything you would need for a saltwater aquarium and reef tank setup. Alkalinity, Calcium, and Low Range Phosphate test kits are all included with reagents, along with even a PH & Temp Meter. If your looking for a high quality and accurate testing for your aquarium we have everything you need at Fragtastic Reef and all the high end brands. Marine Alkalinity Checker (dKH) - HI772: Two sample cuvettes, alkalinity reagent starter kit for 25 tests, 1 ml syringe and tip, battery, instructions, and quick start guide. Marine Calcium Checker Checker - HI758: Two sample cuvettes, calcium reagent starter kit for 25 tests, dropper, 1 ml syringe with tip, 100 microliter pipette with tip, plastic pipette, battery, instructions, and quick start guide. Marine Ultra Low Range Phosphorus Checker - HI736: Two sample cuvettes, 31 packets of reagents, battery, instructions, and quick start guide. pHep Waterproof pH/Temperature Meter - HI98107: Protective cap, pH 4.01 buffer sachet, pH 7.01 buffer sachet (2), electrode cleaning sachet, battery, instrument quality certificate and instruction manual. Electrode Storage Solution - HI70300M: 230ml bottle for use with pHep. pH 7.01 and 10.01 Calibration Buffer Sachets - HI770710P: Premium quality pH 7.01 and 10.01 calibration buffer solutions. Ultra-Pure Deionized Water - HI70436M: For use in HI758 Calcium Checker and for cleaning Checker cuvettes. syringe and tip, battery, instructions, and quick start guide. instrument quality certificate and instructional manual. Really the product is very good, met my expectation. A great comprehensive kit of all the testers you need to maintain a successful stable reef without having to piece together each one individually. well if you can afford to buy it all at one time I will tell you its sooo worth it. I am having to buy one at a time, but the checkers work so much better than trying to guess what the colors are..
Limited Time - FREE SHIPPING ON ALL ORDERS OVER $29! Most orders will ship the same or next business day of when you place the order. We can ship to virtually any address in the world. Note that there are restrictions on some products, and some products cannot be shipped to international destinations. Almost all items on are website qualify for FLAT RATE or FREE shipping! Order over $29 in products and receive FREE shipping on your order. We ship Worldwide everyday. Please contact us for shipping quotes and availability on any products you would like to purchase. International orders do NOT qualify for free shipping, please contact us for a shipping quote. We only accept Paypal as payment for international orders and customers and must ship to a confirmed address. EVERY ITEM WE SELL IS BRAND NEW & COMES WITH A FULL MANUFACTURE WARRANTY! We do not sell used, defective, or returned product to our customers. Only exception to this is in our clearance and open box section of our website. Even those items still include a full warranty, and are usually an amazing deal if your looking to save money! Most brands and products we sell have typically a 1 year warranty, with some products having up to 3 or more years. If you have any questions on warranties you can check the manufacture website or just contact us with any questions. At FragtasticReef.com we sell only the best products, and only products we recommend and use ourselves, so you can buy with confidence. We are an authorized dealer and retail partner for every brand we sell! We will send you emails on updates, new products, and ways to save you money. ©2016 FragtasticReef.com - All Rights Reserved.